Home of the famous Wabash Cannon Ball passenger train. Also ran Blue Bird and Red Bird passenger trains. Served all the way to Kansas City. Merged with the N&W and now part of the NS. A famous Wabash slogan was: Work or Play, Go the Wabash Way! The famous WABASH Follow The Flag logo is featured on this 100% white premium tee in beautiful red white and yellow colors. 6 inch x 6 inch square tin logo sign of the Ann Arbor Railroads blue flag. 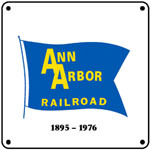 6 inch x 6 inch square tin logo sign of the Ann Arbor Railroads Ferry in the Fog logo used briefly. 6 inch x 6 inch square tin logo sign of the Wabash Cannon Ball train operated batween Detroit and St. Louis. 6 inch x 6 inch square tin City of Kansas City logo sign of the Wabash Railroad. Historic Wabash F-unit diesel displayed on this mug is headed west, bound for Kansas City. Coffee Mug featuring the Wabash Railroads Follow the Flag logo superimposed over the paint scheme of its diesel locomotives. A very unique way to present the railroads logo. Coffee Mug featuring the newest WABASH widebody diesel in the Norfolk Southern Railroads Heritage Fleet. Colorful Wabash Railroad mouse pad with a beautiful F-unit diesel rolling through the country side of Michigan, Illinois and Missouri on its way to Kansas City. 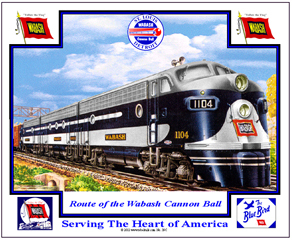 Mouse pad honoring the new Wabash Heritage diesel operated by the Norfolk Southern Railroad. 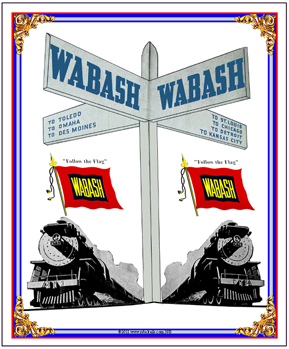 Reproduction tin sign of an advertisement used to promote the Wabash Railroads many destinations. 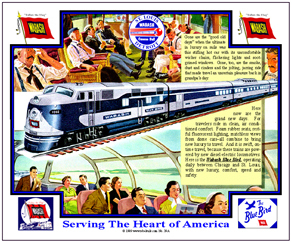 Unique tin sign of an image issued by the Electro Motive Division of GM to promote the new F-7 motive power arriving on the Wabash Railroad in the early '50s. Unique tin sign of an advertisement issued by the Electro Motive Division of GM showing changes in Wabash passenger service over the years, especially with the new EMD diesels. 6 inch x 6 inch square tin logo sign of the drumhead used by the Wabash Railroad on the tail end of its passenger train. 6 inch x 6 inch square tin diesels logo sign of the Wabash Railroad. 6 inch x 6 inch square tin Follow The Flag logo sign of the Wabash Railroad. 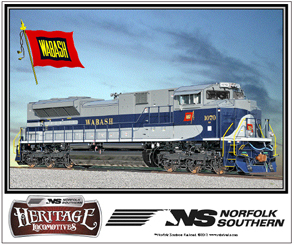 Wabash diesel joins Norfolk Southern Railroads Historic diesel fleet. 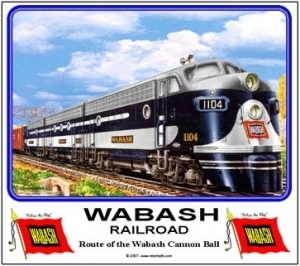 6 inch x 6 inch square tin sign of the historic Wabash Heritage diesel. A powerful locomotive paint scheme. 6 inch x 6 inch square tin Midnight logo sign used by the Wabash Railroad. 6 inch x 6 inch square tin logo sign of the Red Bird drumhead used by the Wabash Railroad on the tail end of its Red Bird passenger train.